This photo won second place in the 2005 Canadian Geographic Winter Adventure Portraits photography contest. I took this photo on March 12, 2004, on day one of a three-day ski expedition to climb Mount Mamquam in Garibaldi Provincial Park, British Columbia. The photo was taken near the Opal Cone, an extinct volcanic crater between Mount Garibaldi (also a volcano) and Mount Mamquam, close to our campsite atop the ridge overlooking Mamquam Lake. The interesting undulations on the snow were caused by earlier rainfall flowing down the snow slopes. The final remnants of the morning's cloud cover can be seen burning away just over the horizon to make way for the beautiful clear skies that would accompany us for the next two days. 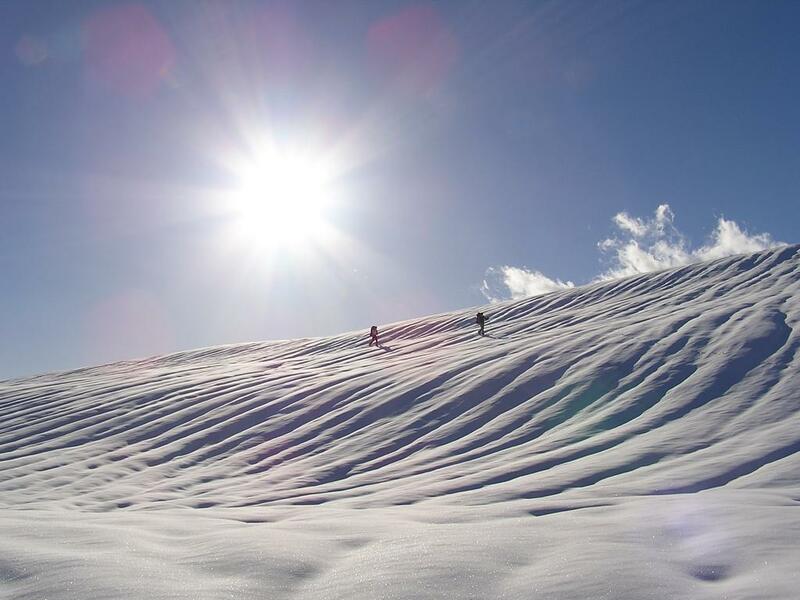 I was pleasantly surprised by the composition of this photograph: the sun and its artifacts created by the lens, the small cloud over the snow, the dark lines of shadow, and the two skiers in the distance, traversing untouched snow. Although we came very close, we did not make the true summit of Mount Mamquam. We did, however, enjoy a fantastic ski trip amongst friends. See the complete trip report.